I'm crushing on all things denim right now but one piece in particular is a denim vest. I'm really loving how I'm seeing it styled on the streets and think it's time I get in on the trend. However finding the right style to suit your body can turn out to be a difficult task. I would start off by figuring out what kind of denim wash you are most comfortable wearing. Then decide where you envision it sitting on your body. Do you want it to be a shorty? To sit on your hip area? Or do you prefer more length? This season we have been seeing a trend where the armholes have exaggerated fringe but maybe you prefer more polished and finished edges? 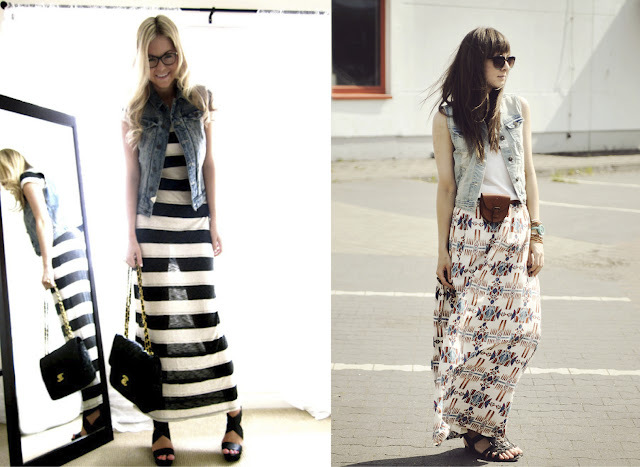 Regardless of fit, style and colour I'm loving denim vests because of how they can change the feeling of an outfit. I adore the look most when worn with maxi's. Sometimes you can't help but to feel a bit dressed up when wearing a dress/skirt when you are only out for a casual day and that is exactly how a denim vest can pull back that look to achieve still a polished but more relaxed look. 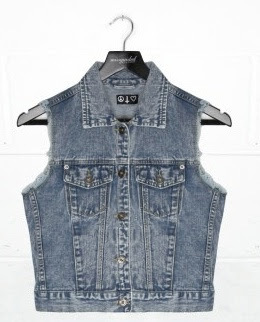 Have you been rocking a denim vest this season? How do you like to wear it best? Wish me luck on my hunt for the perfect denim vest for me. I'm crushing on denim on denim. Do you think it's too much or are you in agreement that it's pretty bada$$ when styled right? Yes! the vest is fashionable, I think of buying one. Beautiful and I follow you, follow me. Love the vest. Got to buy one too. Thanks for visiting my blog :-). I love jeans jackets!! :) Thank you for your comment!! I follow you now with google friend connect and bloglovin too!! Hope you'll do the same!! I wait for you in my blog! Kisses! Gotta love denim on denim. I think the key to working that is making sure all your pieces are slightly different shades. following u back via bloglovin! great post!!! i love a good denim vest!! I have to start wearing my jean jack more often now! That's a good basic must have! I have like three haha! I'm desperate for one of these too!! I've been eyeing it up in Topshop for so long but never got round to buying it! i've been debating whether to buy one or not!